The deadline for ordering advance tickets for this year’s Weston-super-Mare Beach Race has been extended by a week following the addition of two big-name riders to the line-up. Tickets for the annual race, which attracts crowds of 50,000, are now available to order online up until this weekend. “It’s only in the last few days, just as the entry deadline was approaching, that we finally managed to confirm Jeffrey and Shaun for this year’s RHL Beach Race at Weston,” said RHL Activities director Gareth Hockey. “We know a lot of riders at Weston like to measure themselves against the professionals, and they don’t come any more professional than Herlings and Simpson. “It’s the big name riders that a lot of spectators come to see. This is why we’ve extended the entry and ticket deadline. “We’ll now be taking entries up until midnight on Sunday, October 7, which will give everyone more chance to sign up to take on the likes of Herlings, Simpson, Brad Anderson and Tom Church around the infamous Weston dunes course. “Advance tickets sales, with significant discounts on gate prices, will also continue until same cut off time. It takes balls to ride a motocross bike competitively but exactly what turns someone into a Beach Racer has got to be something else. 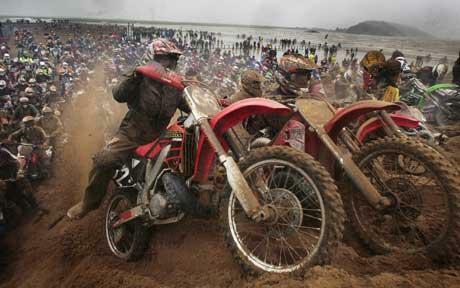 The 2011 edition of the Weston Beach Race was in a mix of high winds and wet weather but the riders and fans still came out to turn it into a sweet day. Massive props to everyone who took part.